Shanghai LJ Machinery Co., Ltd.
Curing System LED Light Curing System Color Management Admitted to International ICC Standard, with Curve Line Function. 1400KG Equipment Size: 3822*2120*1095(mm) Product Application The printer designed and produced by our company are supplied in various industries, for example, fields like decoration, advertising, ceramic, glass,metal, plastic, leather, wood etc. In a word, any products you see in flat form can be printed via our UV flatbed printer. 6. Low cost: use of the original ink with the machine and print head, to achieve the use of low cost. 7. Continuous uograding of product software: the use of the global current original software, to ensure the sustainable upgrading of software technology. 2) We support your engineer to learn the technology and products training in our factory directly. It is a manufacturer collecting of research and development, production, sales and after-sales. 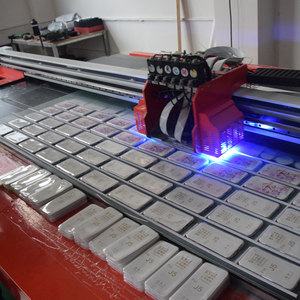 Mainly produce:medium and small format multi-function flatbed printer, high precision LED UV flatbed printer, free coating printer and so on. 6. Q: What's your printing machine warraty and technical support9 A:One year warranty for all our machines. Product Paremeter Printing size 600mm * 420mm Motors Servo motors Print head 2*EP DX10 Media thickness up to 200mm Height adjustable Automatic Max. media weight 30KG Print method Direct printing Head printing precision Overlap small than 0.1mm Color C.M.Y.K.LM. Software language Korean, German, French, Portuguese, Japanese, Spanish, Italian,Finnish,Dutch, English, etc. 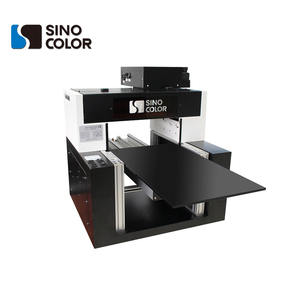 Advantages: 1. it can print out white ink and it can print on dark products 2. it can print out the relief effect 3.it can print on case of any color 4. it can print well without coating 5. it dry immediately after printing 6. directly print picture from computer onto flat product; Plaese kindly note: This Machine needs regular maintenance. It will reek of some Smell, so it is suggested that the machine had better using on the studio and you had better to use up the UV inks within a month after it is opened, since it is easy to deteriorate. We hope we will build up with all buyer the best and long term relationship due to our honesty,speed and the best services. 2.Can LED UV printer print embossing effect9 Yes, it can print embossing effect, for further information or samples pics, please contact our representative salesman. 3.Does it must be sprayed a pre-coating9 UV printer can print white inks directly and no need for pre-coating. 4.where can i buy the spare parts and inks9 Our factory also provide spare parts and inks,you can buy from our factory directly or other suppliers in your local market. 3.Both water cooling and fan cooling to make sure the printer's stability . We also provide multi-languange 24 hours service ,such as English ,French ,Spanish etc. Multi will provide on-line service,instruction,photo and video for help you fix the problem. Alibaba.com offers 1,252,004 print uv products. About 3% of these are printing inks, 1% are inkjet printers, and 1% are digital printers. A wide variety of print uv options are available to you, such as flatbed printer, letterpress. You can also choose from free samples, paid samples. There are 1,250,817 print uv suppliers, mainly located in Asia. The top supplying countries are China (Mainland), Hong Kong, and Taiwan, which supply 98%, 1%, and 1% of print uv respectively. Print uv products are most popular in North America, Western Europe, and Domestic Market. You can ensure product safety by selecting from certified suppliers, including 257,872 with ISO9001, 190,874 with Other, and 66,322 with ISO14001 certification.